I met Kabukojo face to face today. 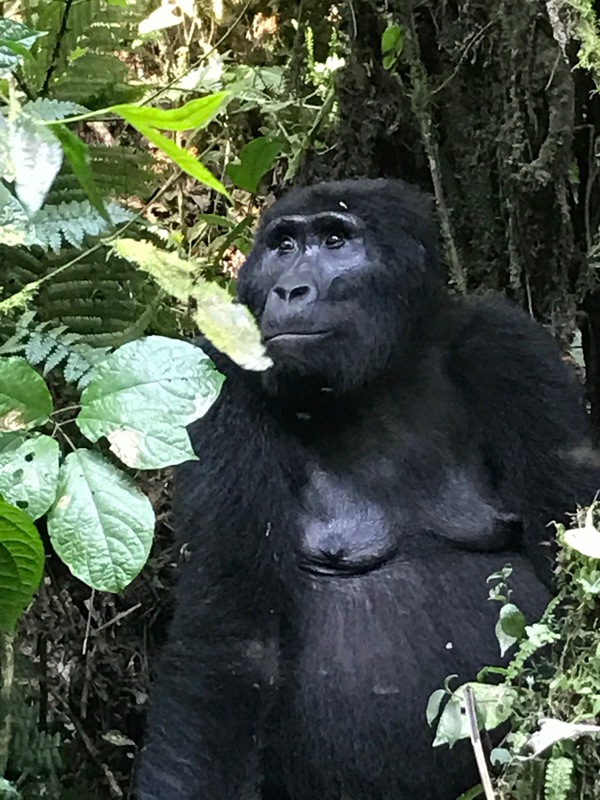 Kabukojo is a 450-pound, 19-year-old mountain gorilla who protects his Rushegura family troop in the Bwindi Impenetrable Forest. He is a handsome silverback who leads his troop through this section of the forest just a short walk from my Lodge. What does Kabukojo do during the day? Anything he wants. We hike about an hour along a forest road to meet our tracker and guard. The guard is armed not for the gorillas but for elephants. Rangers have habituated gorillas by being around them, imitating them and become known. They do this for years before taking people to visit. Kabukojo’s Rushegura group has been habituated for visitors since 2002; the elephants aren’t as friendly. Gorillas live in groups called troops. Troops tend to be made up of one silverback, multiple adult females and their offspring. Young male blackbacks are welcome in the group until they start getting ideas about the females. There can be only one Alpha silverback, though a second submissive or retired silverback may remain in the background. A silverback is typically more than 12 years of age; with maturity comes the silver back and large canine teeth. The Rushegura troop numbers 17 with four blackbacks, three juveniles, five females and four babies, the youngest being 2 months old. And Kabukojo who rules the roots. During our viewing time, we will see 14 of its members. From the road we descend a steep mountainside and fight our way along a vine and branch strewn path to a muddy area at the bottom of a ravine. Within a few minutes we encounter a young blackback and some feeding females with babies. They seem unconcerned about our presence and the sound of snapping cameras. The blackback is not welcome around the females and moves away as the mothers forage for leaves, babies clinging to their backs and sides. 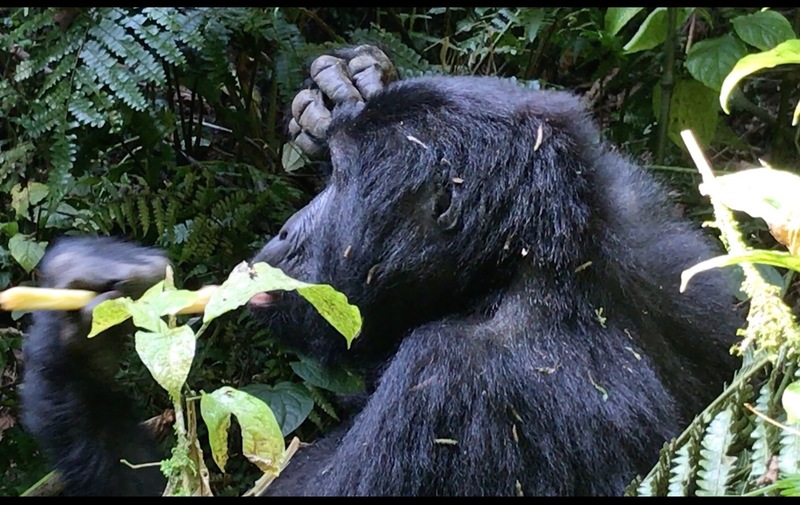 Following the females and gorilla sounds from the forest, we search for “The Boss.” Seeing Kabukojo for the first time, sitting relaxed but vigilant under a tree, gives the term ‘Alpha male’ a whole new meaning. He is huge! He observes us while we stare at him; he seems more polite than his visitors. I am but 10-15 feet away. His hands are immense. He may be calm but my heart skips a beat as he casually gets up and walks past us, tired of the company already. ​ ​Gorillas are knuckle-walking, ground-dwelling, predominantly herbivorous apes. They are our largest living primates and I offer no obstruction when a gorilla walks past me. I step aside. The DNA of gorillas is highly similar to that of humans, 98.4%, and they are the next closest living relatives to humans after the chimpanzees and bonobos. I wonder if Kabukojo senses we are harmless, pale cousins? Male gorillas weigh 300 – 450 lb while adult females usually weigh 150–250 lb. Adult males like Kabukojo are 5 ft 7 in to 5 ft 11 in tall, with an arm span that stretches to as much as 8 ft 6 in. He is referred to as a silverback because of the silver hair on his back. The bulkier mountain gorilla is more darkly colored and has thicker hair than other gorilla types. And like humans, gorillas have individual finger prints, though our guides recognize individuals more often by facial characteristics. 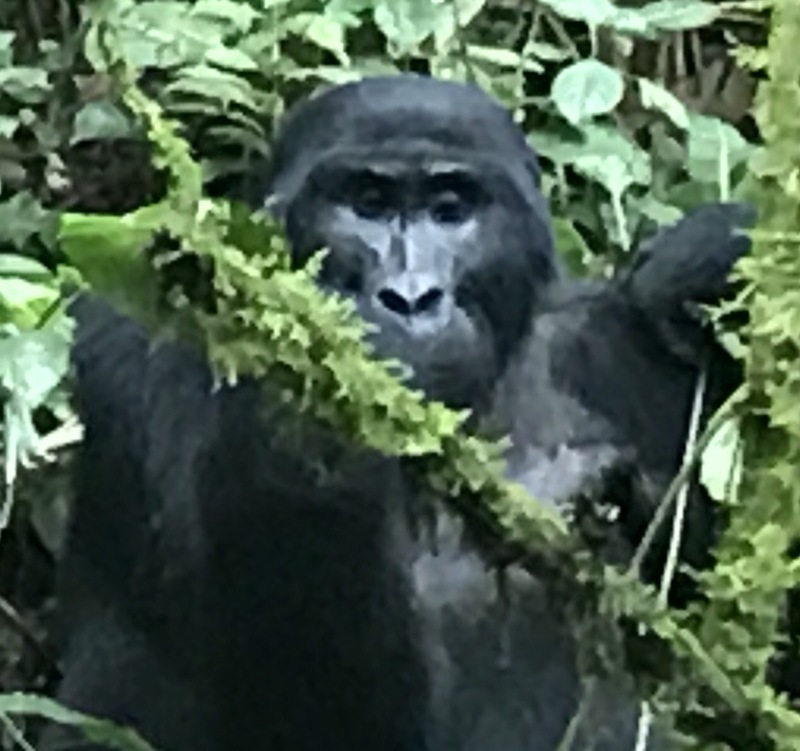 The forest becomes thicker and darker as we stumble over tree trunks, duck under branches and entangle our feet in vines as we follow the gorillas as they forage for food. A gorilla day consists of foraging for food, resting, then eating some more. Leaves, stems, pith and shoots with a bit of fruit make up their diet. Their foraging may take them a half mile a day so trackers can usually easily find them when they look where that last saw them the previous day. Gorillas rarely drink water because their food contains what water they need. The females will walk a short distance then sit and eat for a short time. We catch up best we can and invade their space to watch. Shortly, they move again. Nest builders, they tend to sleep on the ground and the young build their nests close to their mothers. 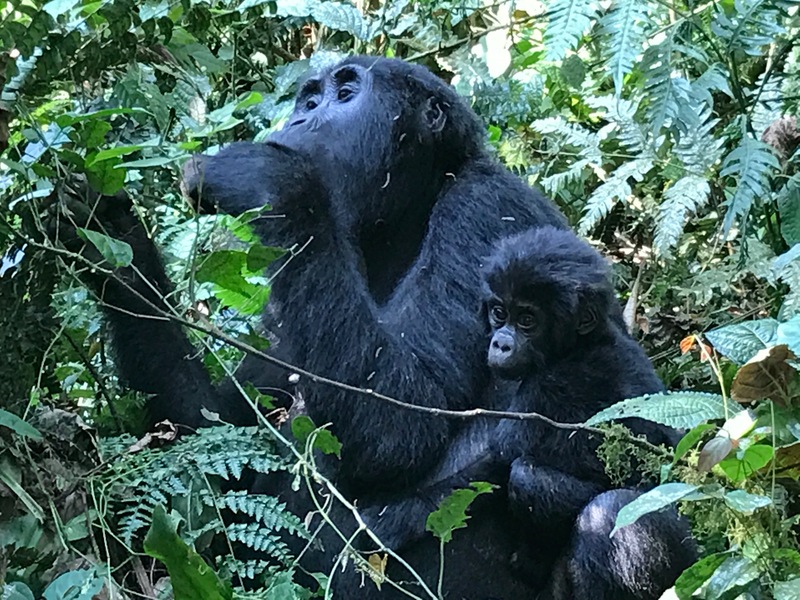 Gorilla infants are vulnerable and dependent, thus mothers are their primary caregivers. Male gorillas are not active in caring for the young, but they do play a role in socializing them. The silverback has a largely supportive relationship with the infants in his troop and shields them from aggression within the group. Infants remain close by their mothers for the first five months and mothers stay near the silverback for protection. By 12 months old, infants move further away. The older they are, the further and longer time they remove themselves from their mothers. One mother climbs a tree and allows her young infant of about a year to climb into the branches. Perhaps it is Kibande and infant Kanyindo. The infant dangles and plays under mother’s guidance, practicing for adulthood. Another older juvenile startles me as he swings down nearly on top of me to rush off into the dense undergrowth. Mothers Karungyi and Buzinza eat and tend to their inquisitive youngsters. Kabukojo walks into the bushes, grunts his order, and removes himself from our presence. Everyone seems to follow his lead. So do we. The silverback is the center of the troop’s attention, making all the decisions, mediating conflicts, determining the movements of the group, leading the others to feeding sites, and taking responsibility for the safety and well-being of the troop. Younger males, known as blackbacks, may serve as backup protection. Blackbacks are 8 – 12 years and lack the silver back hair. The bond that a silverback has with his females forms the core of gorilla social life. Females form strong relationships with males to gain mating opportunities and protection from predators and other males. The silverback is handsome and knows it. So do the females. Occasionally we see the slapping and tearing of vegetation or thumping the ground with palms. We hear the grunts and barks as we follow the gorillas. Between 16-25 distinct vocalizations are known to our trackers, many of which are used for group communication. Grunts and barks are heard most frequently while traveling, and indicate the whereabouts of individual group members. Deep rumblings suggest contentment and are heard frequently during feeding and resting periods. But mostly, the gorillas sit quietly eating or watching us, all patience and calm. The quiet is broken by a frisky juvenile running past, or a baby swinging from a branch practicing its gorilla skills. Occasional conflicts arise, most often resolved by a display of pounding, slapping the ground or tree trunks and charging past to intimidate without becoming physical. Kabukojo easily gets our attention. A 450-pound gorilla grunting and slapping the ground or pulling small trees down makes his point. 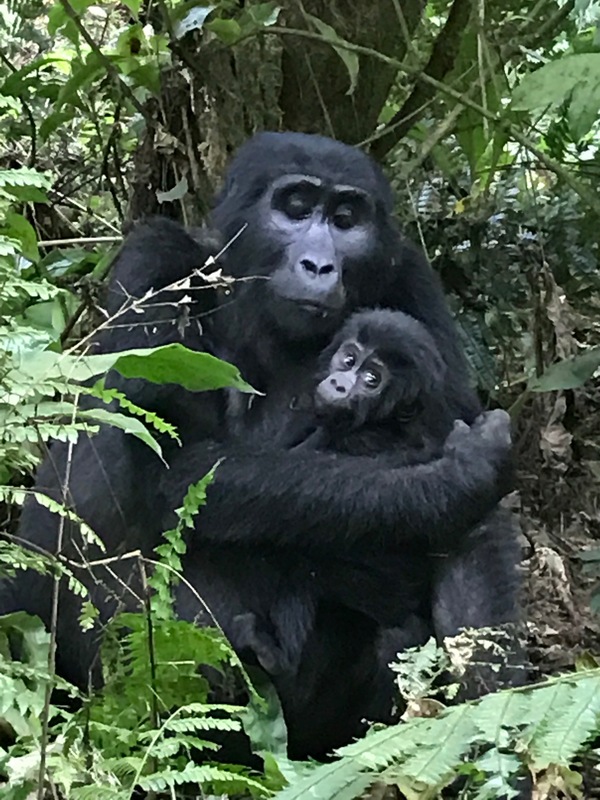 Currently there are about 880 mountain gorillas in 3 countries: 400 in Uganda, 400 in Rwanda, and 80 remain in the Congo. In fact, gorillas are very smart and ignore borders as many have moved to Uganda from the Congo where poachers are a danger. They have adopted travel to avoid harm. It is good news that the mountain gorilla population is increasing. Today, we have shared space with just a few of them. Sadly, our one hour of viewing has expired and we must take our final photos. It has been a wonderful experience following Kabukojo’s family. While we leave them to their privacy in this beautiful Impenetrable Forest, we as weak upright humans must fight the vines and climb the mountainside to return to our nest for the night. I think they are glad we are going but too polite to say so.